The Nile winds its way 6,500 kilometres from its origins in the Great African lakes to the Mediterranean. Its sources were unknown until the 19th century. Today thay have been identified in the Nyawarongo river, a tributary of another river which enters Lake Victoria. The Nile flows northwards across the immense savannah with its woods and marshes before gathering in to itself from the left the waters of the Bahr Ghazzal (the Gazelle River) originating in the Darfour and Congo regions, and from the right the waters of the Sobat, the Blue Nile (or Bahr el Azrak) and the Atbarah from the high plateaus of Abyssinia. It then runs up against the limestone barrier of the Sahara and its progress is interrupted by the cataracts as it flows slowly towards the Mediterranean without receving the waters of any other tributary. 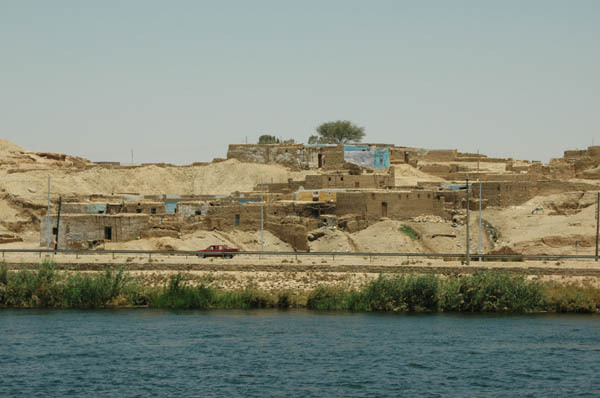 Egypt proper is simply that northern part of this great valley which extends from the cataracts at Aswan to the sea. From Aswan to the ruins of Thebes the valley narrows, being penned in between two chains of rocky mountains, but between Thebes and Cairo it becomes considerably wider again. 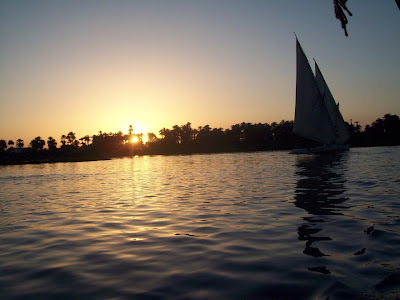 At El Manach the Nile divides into two: the eastern part constitues the principal branch. Shortly after the Nile leaves Cairo it loses sight of the mountains which up to then have followed its course. The Arabian and Libyan mountains get further and further apart and rise up respectively on the edge of the Red Sea and in the Mediterranean to the west of Alexandria. In the vast triangular plain of the Delta a multitude of canals link the Rachid or Rosetta branch to the Damiette or Domiatte branch. Each year following the torrential rains which fall on the mountains of Abyssinia and the region of the equatorial lakes, the Nile becomes more and more swollen until finally it bursts its banks and in a few months fills up the entire valley. By the end of April the flooding has reached Khartoum, the capital of the Sudan, and by the end of May or beginning of June it reaches Egypt proper via Nubia. Until October the valley remains covered with the beneficial layer of mud laid down by the flood which only disappears completely at the beginning of December. As a result of this periodic flooding Egypt has a particularly rich flora and fauna. There are many types of big trees, numerous species of acacia and sycamore, forests of palm trees and many aquatic plants including the papyrus and the lotus. The Nile and its lakes are swarming with fish. Most domestic animals have been known in Egypt since the earliest times. On the other hand many species of wild animal have disappeared with the passing of the centuries. Thus one no longer finds there either lions or the large cats such as the leopard and the cheetah. The hippopotamus left the Delta towards the end of the 16th century and following the appearance of steam boats on the river it retreated beyond the cataracts as did the crocodile. 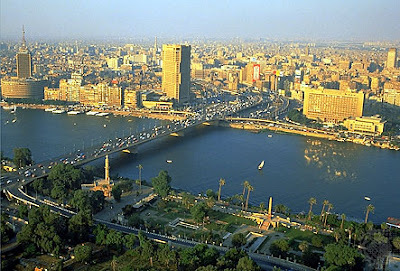 If it were not for the flooding of the Nile the great Egyptian valley would be a sterile desert. This is why Herodotus’s statement that « Egypt is a gift of the Nile » continues to be as true today as when he said it.